Once you’ve created a workflow and defined the trigger details, you’ll set up the actions you want to happen. Workflows can send emails or create and assign activities. In the article Anatomy of a Workflow, you can learn about the basics of workflow actions. Now, you’ll get into the details of setting up workflow actions. To add an action to a workflow, click the New Action button. You can create actions from a workflow’s detail tab or actions tab. A workflow is required to have at least one action to function. Add as many actions as needed for your workflow. When creating an action, select if you want to send an email or create an activity. Once you select the kind of action, set when you want the action to occur in relation to the trigger. Actions can be set to happen before or after a trigger depending on the trigger type and trigger when options. Set a number of days, weeks, or months. When you select 0 Days after for the action timing, the action occurs almost immediately after the workflow is triggered. Reminder: Before action trigger timing can only be used for triggers of date is approaching. After you've chosen to send an email or create & assign an activity, here’s what you can set for details on actions. When setting an action to send an email, there are a few details you need to set up. Email Subject Pick a subject that conveys the purpose of your email. Make sure to follow best practices for sending an email by using short and simple subject. Send to Select a recipient. Options are based on the trigger type selected. BCC Select a recipient to BCC your email to keep them in the loop. From Name Select or enter a from name. Use the pencil icon to manually type a From Name. Options are based on the trigger type selected. When sending to a User, defaults to AgencyBloc Notifications. Reply to Email Select or enter a from name. Use the pencil icon to manually type a Reply to email. Options are based on the trigger type selected. When sending to a User, defaults to no-reply@agencybloc.com. Email Header Select if you want to include your business logo at the top of the email. When sending to a user, a notification email format is used. Once you’ve set email details, compose your email content in Edit Email area. Check out the articles on creating & drafting emails for additional details on composing emails. You can use your saved content to reduce time in creating commonly used email messages. Additionally, use variable data to personalize your emails. Creating and Assigning activities in Automated Workflow is much like how you would normally create an activity. Set activity details and when a workflow is triggered, the activity will be created and assigned based on the details you set. Notes Enter a brief note for follow-up instructions or to document the event. Subject Pick a subject that conveys the purpose of the activity. Priority Set the priority for the activity. Status Set the status for the activity. Create an activity with a complete status when you want to track an item for historical purposes. Type Pick a type for the activity. Method Select an activity method. Follow-up Type Assign a User to handle the activity. When assigning to a Servicing Agent, workflow assigns to a user based on the linked agent. Due Date Delay Select the due date delay for the activity. The date is delayed from when the activity is created by the workflow. To add more actions to a workflow, select the New Action button again. Add as many actions as needed to your workflow. You can use a combination of emails and activities or just one or the other. You can structure sequence your workflow actions over a period of time to match business processes. Once your workflow is set up with your trigger and actions, activate the workflow from the details tab by selecting Save & Activate. Then watch your workflow in action and take steps to manage your workflows when needed. How do I schedule an action to occur at the same time a workflow is triggered? Good question. When you select 0 Days after for the action timing, the action occurs almost immediately after the workflow is triggered. Can a form be attached to emails? Adding files like PDF’s, documents, or spreadsheets is not available in email campaigns, automated workflow, or saved content. We suggest linking to a document stored on your website or a web storage service. Is it possible to have other information populate in the email or just the client’s name? You can use Saved Content and/or Variable Data in the body of the email. Just remember, make sure the data is populated before you expect the action to occur. 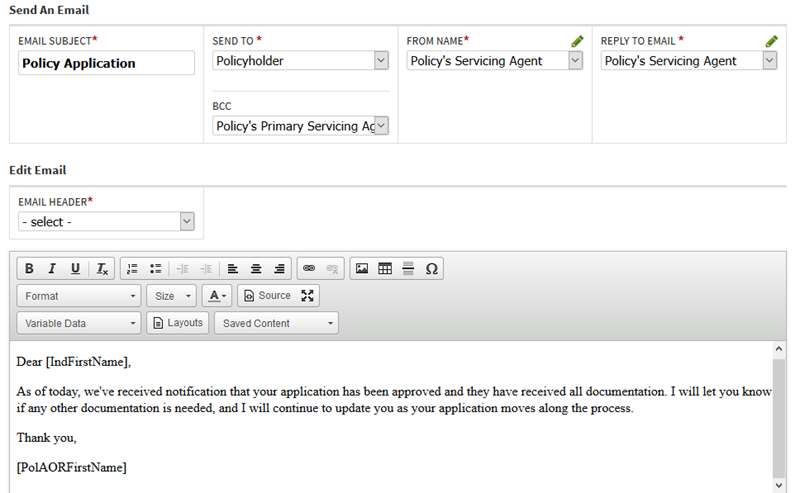 Does the email show up as @agencybloc email, or can it be my own email address? You can change the reply-to and from email to be your own email or type in an email address when setting up an email action.